Intellux and Geniux Review - Miracle or Myth? Intellux and Geniux Review – Miracle or Myth? Home » Nootropics » Intellux and Geniux Review – Miracle or Myth? If Jim Carrey revealed to you the secret that has made him millions over the course of his acting career, would you listen? Well, according to this ad I just saw on Yahoo, he’s doing just that. 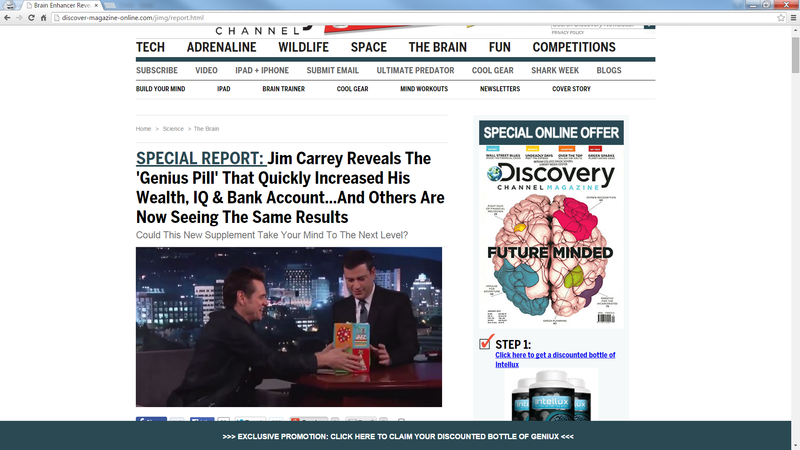 In a magazine article I read on Discover channel online, apparently Jim Carrey has been taking a supplement to help him possess a mind-altering work ethic and creativity, and making him a very rich man in the process. It was revealed on his most recent appearance on the Jimmy Kimmel show that this supplement is non other then a combination of Intellux and Geniux, 2 “smart pills” that he and other celebrities have been taking for years to help them achieve “mind blowing” focus and skyrocket their careers. So, are these supposed “brain boosters” really all they’re cracked up to be? Well, most likely the answer to that question is NO…but we figured we could give it the benefit of the doubt before jumping to any conclusions. According to their official website, Intellux is a “#1 rated all natural smart pill” designed to give you intense focus, achieve enhanced mental clarity, and improved your short and long term memory dramatically. The ingredients in Intellux include a phosphatidylserine complex, which is essentially a chemical that is found in many common foods, but were actually once made from cow brains….yummy! This compound has actually been used to help age-related diseases such as Alzheimer’s disease and even has been shown in limited clinical studies to help young adults suffering from ADHD. But is this the ONLY ingredient found in Intellux?? Well, there’s no indication of a proprietary formula, but my guess would be that it probably contains some other extracts, including ginkgo biloba, ginseng, vincopocetine, caffeine, bitter orange extract, yerba mate, and some type of choline substance. I’m only going to touch on Geniux very briefly here, but I have a very extensive review written if you want to take a look. Geniux, just like Intellux, was recently introduced to the market as a cognitive enhance (or smart pill), and boasts numerous benefits. I actually had a chance to test it out personally, but my results were not very satisfactory. According to them, their fast acting formula is designed to deliver an unparalleled boost in focus and memory, as well as give you extreme mental energy. The main problem with this is that their supposed ‘revolutionary’ formula is comprised of solely 4 ingredients…Bee pollen, Caffeine, Eleuthero extract, and Gelatin. That’s not very revolutionary in my book. 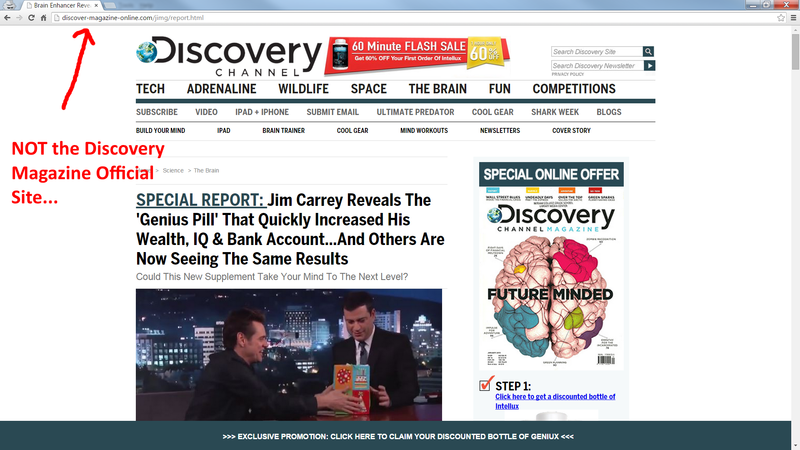 So back to the original part of the story, the supposed “Discovery Magazine” article that talked about how Jim Carrey revealed how this secret ‘Genius pill’ increased his wealth, IQ and Bank account. At first glance, the page looks very convincing. It actually “looks” like the real Discovery Channel website, complete with links to other pages, a special online offer to subscribe to their magazine, and links to their social media accounts. If you read it, they literally quote Jim Carrey saying ‘when I started taking this I went from doing stand up comedy to getting paid over $10 million per movie…it changed my life”. Tom Cruise revealed in a recent interview on ‘The Tonight Show’ with Jimmy Fallon that he’s been taking Intellux and Geniux. Tennis legend Roger Federer has admitted to using them to maintain high levels of focus and performance everyday. Even Daniel Craig has been getting in on the action, using Intellux to help him memorize lines and improvise on the set of his latest Bond films. So, What’s the REAL Truth About All Of This? The problem is….it’s ALL FAKE! That’s right guys and gals, the whole thing you just read was a complete fabrication. Or what we call in the industry a ‘Farticle’ (Fake Article). It’s designed to make you think that it’s legit by employing a number of very sophisticated cloak and dagger techniques designed to make you want to buy instantly. As you can see, this is NOT the real Discover Magazine website. The real website is discovermagazine.com, NOT Discovery dash Magazine dash Online dot com. This is further proven when you attempt to click on some of the other links on the page. You’ll notice that every link go’s to a broken page. 2.) Jim Carrey did NOT say that he used Intellux and Geniux to give him mind blowing focus and concentration on the Jimmy Kimmel show. How do I know this?? As you can see (if you watched the whole thing), not ONCE did he mention Intellux and Geniux…In fact, he didn’t mention that he is taking ANY supplement or substance to help him achieve the success he has. The same goes with the claim that Tom Cruise has been using them. I looked up the Jimmy Fallon interview and, yet again, there was not one mention of him using these 2 supplements in combination. 3.) If all of the above isn’t convincing enough, take a look at the comments at the bottom of this Discovery Magazine article. They all talk about how great Intellux and Geniux is, and how much wealth and success they’ve achieved using these 2 pills. One of them is fake. Try to leave a comment yourself, and you’ll find that it’s impossible to do so. Not only that, but they apparently look like Facebook comments. If they were REAL Facebook comments, you would be able to click on them and see the persons profile. But alas, if you try to do so nothing happens. I’ve seen this exact same add for other nootropics like Cogniflex and MZT 48, but this time that are calling Intellux “1.5X more potent than Adderall and 100% safer”. Just like the Discovery magazine stuff above, they pull all the same B.S. here with a slightly different twist. For example, this time they claim that renowned genius Stephen Hawking is calling Intellux a “pill that will change humanity”. They’re even saying Denzel Washington uses it, claiming that the “evolution of the brain” is here. Even better, Ashton Kutcher is force feeding his employees to take Intellux, and as a result his tech startup has turned into a billion dollar company. Of Course, as USUAL, this is all B.S. The first thing you’ll notice is that, just like with the Discover magazine website, this is NOT really the Forbes website. 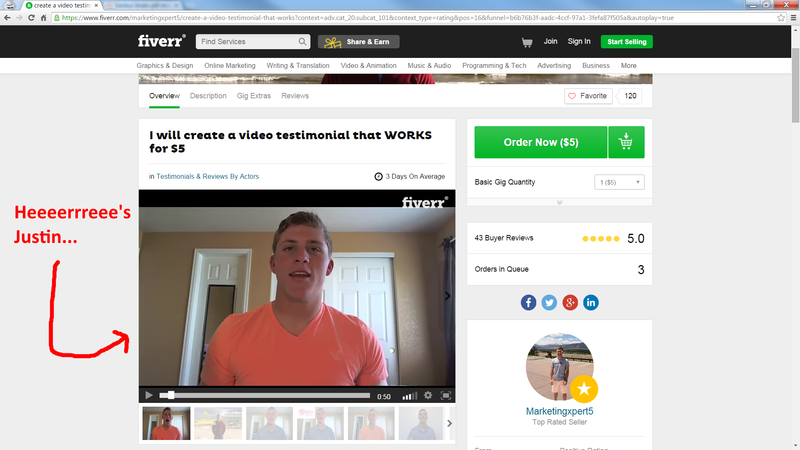 The website showing here is geniusnewsreview dot com, not Forbes.com. Of course if you look up who owns that website, it’s privacy enabled, which basically means you won’t see who’s behind it. The second thing you’ll notice is the Facebook comments at the bottom of the page. Literally ALL of these comments are completely fake. I know this because if you try to view the profiles of any of these people, it just doesn’t happen. 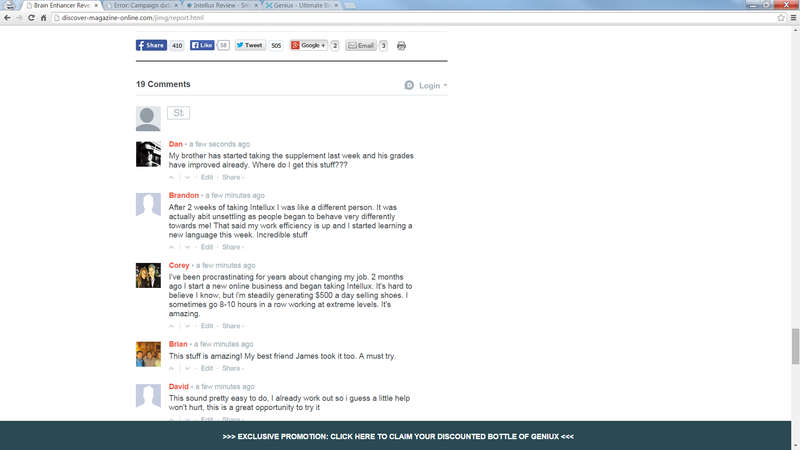 You can also see for yourself by simply trying to add your own comment to the page. I’ve seen this false advertising, especially for nootropic supplements, time and time again. 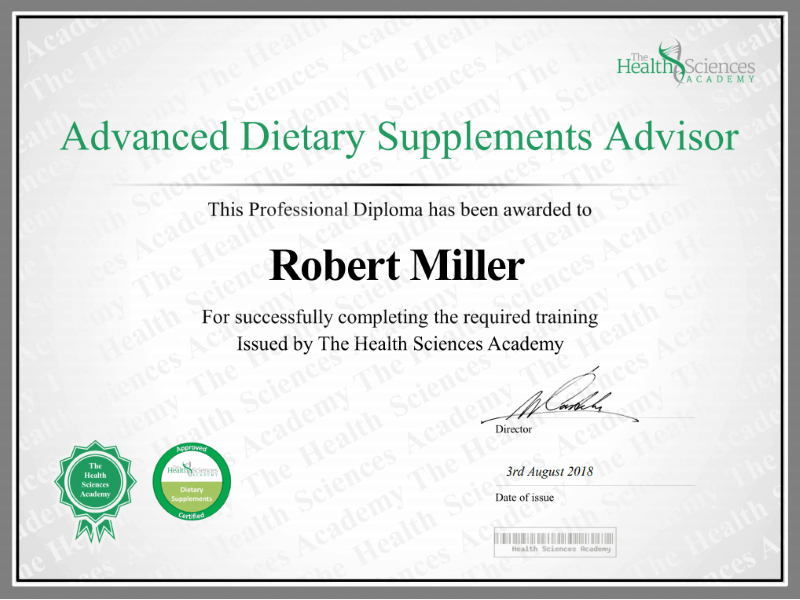 Check back in another week or so, and you will see a TOTALLY different supplement making the EXACT same claims that some celebrities have been using these supplements to achieve huge financial and career success. Don’t buy into the B.S. guys…there really are supplements out there that CAN help you achieve increased cognition and focus, but Intellux and Geniux are definitely NOT one of them. Have You Used Intellux and Geniux? Leave Your Review Below! Optimind is the closest thing to Aderall that Ive tested, and Ive tested ALOT of Nootropics. The Nootropics All Star Pack is a GREAT combo of supplements that will improve focus, concentration, and mood. Mind Lab Pro takes a longer, but equally as effective, approach to increasing focus. Work Like Adderall? Click Here To Find Out! 7 out of 9 people found this question helpful. Previous Previous post: Limitless Forte Review – Does It Work? Next Next post: NooCube Review – Should You Use It?